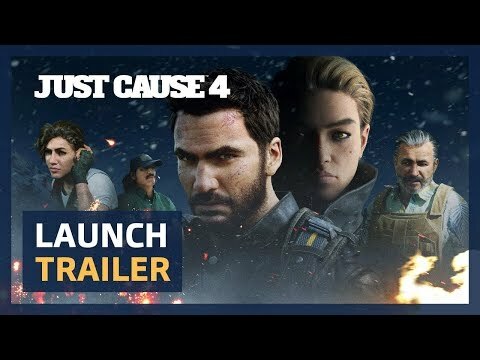 Set in the fictional South American world of Solis, JUST CAUSE 4 takes the series incredible destruction and unique physics to a whole new level with the introduction of tornadoes and other Extreme Weather events. JUST CAUSE 4 has four distinct biomes: Rainforest, Grasslands, Alpine & Desert. With each biome offering its own individual, fully simulated weather event, players will have a truly unique experience as they traverse this deep, diverse world. Rico Rodriguez returns in JUST CAUSE 4 with his trademark parachute, wingsuit and, of course his grapple hook, now enhanced with new functionality and fully customisable. Making it the most powerful and creative tool the player has ever had. Just Cause 4 was released on PC, PS4 and Xbox One 142d ago in the US and the UK. Notify me when Just Cause 4 is available. Based on 1 Just Cause 4 review, Just Cause 4 gets an average review score of 79.